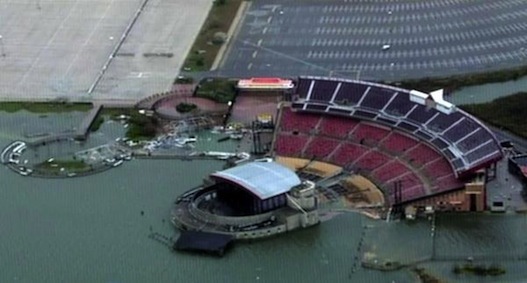 Jones Beach Amphitheater in Wantagh, NY, on the coast of Long Island was underwater as of noon on Tuesday. Photo via Newsday/Twitter. Prosound Network By Clive Young. Hurricane Sandy may have been reclassified as a Superstorm on Monday, but to the pro audio industry, it was only one thing: A nightmare. While Sandy caused billions of dollars of damage during its trip up the East Coast, tours and sound reinforcement providers across the region are now scrambling to get back up to speed, despite the obstacles thrown in their way. SYSOP@madmusiciansforhire.com sent this using ShareThis. Please note that ShareThis does not verify the ownership of this email address.